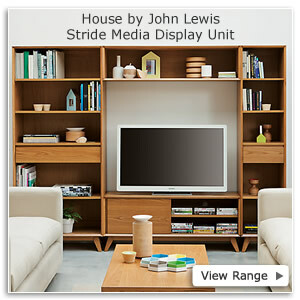 Add the wow factor with an impressive media display unit from House by John Lewis. The new range is contemporary and simplistic in design making the perfect housing for today’s high tech equipment and flatscreen televisions up to 47” wide. TV units are available as stand alone pieces of furniture but if you have the room and wall space then the super stylish light wood Stride Media Display is a must have. What better way to enjoy viewing your books or DVDs, the Stride media display range by House comes in a choice of designs giving you plenty of space to arrange your collection. Choose from a wide and narrow bookcase, two wide or two small bookcases. There is also a bridging unit and a TV cabinet that make up the complete display. All items are available to buy separately. Clean smooth lines give the look a contemporary feel that sits well in most modern homes. Ample storage for all your AV devices can be kept neatly out of the way on the shelf and cupboard. Other features include splayed legs, integral handle and handy cable cut-out in the rear. AVF Buckingham 1400 Stand for TVs up to 65"
The hub of the house requires only the best display and the Stride is just one example of some of the beautifully designed furniture on offer at John Lewis. Investing in well made furniture will bring enjoyment for many years. The all-in-one unit will take centre stage in your home for all your family and friends to admire. 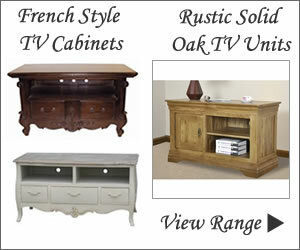 Made from attractively grained oak and oak veneers this latest selection has exciting pieces for the dining and living room. Storage solutions is made easy with a console, lamp and side table plus 6 to 8 seater extending dining table and coffee table.